Back in 2010/11, Belgium went without a government for 589 days. Five hundred and eighty nine days! Parks remained open. Government agencies functioned. And our senators tightened their suspenders and showed up for congressional meetings with or without a chip on their shoulder. There was juvenile bickering and fighting amongst members of the congress. There was finger pointing, name calling, red-faced huffing and puffing. There was a 589 day governmental stalemate. You cork a few vats of beer and PARTY! After all, breaking a ‘Guinness World Record’ for being the country with the longest ever recorded absence of Government in the history of civilized mankind, calls for fanciful fireworks and drunken city-wide celebrations. You invite the international press to the festivities, you show off your patriotic colors… on body parts we can’t show on national TV… and you make your mark on global history by displaying loud ridiculous behavior and madly proudly waving your country’s flag whilst yelling nonsensical talk at cameras, in a language nobody but Holland understands. This, is how Belgium handles political strife. The Belgians aren’t entirely hitting a foul ball with their seemingly ludicrous celebrations… In times like these, what else is there to do but to laugh at your own misery and indulge in good food and a few libations among friends and family? And what better dish to bring people together than delicious and effortless pasta? Pasta is both heartwarming for the soul as well as your wallet’s bottom line. It’s a culinary super hero and a beacon of happiness during hard economic times. So instead of making lemonade with all the sour lemons Congress is throwing at us, why not make a creamy lemony pasta instead? Boil the pasta in a large pot of salted water until almost cooked through. Rather than drain the pasta, take the pasta out of the pasta water with tongs and transfer it to a shallow pan, and don’t worry if some of the pasta water comes with it. We need this extra bit of wetness to create our sauce. While the pasta cooks, boil some water in a small sauce pan and par-boil fresh English peas in boiling water for approx. 2 min, until almost tender. Shock in a bath of ice water to stop the cooking process. If using frozen peas, there is no need to par-boil those. 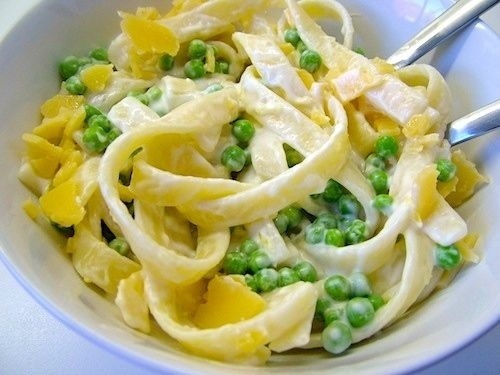 Stir the peas in the hot pasta, along with the crème fraiche, lemon zest & mint. Season with salt & pepper. Add a splash of olive oil to finish. Serve with chunks or slivers of cheese sprinkled over the top… and/or for extra protein, add sliced smoked salmon. My daughter’s favourite receipe, as long as there is enough salmon added. My brother also used to order this *every day* when we were on holidays in Italy as kids.